Spring has sprung and flowers are everywhere. So what better craft could we do this week than flower arrangements. I have to admit, that flower arranging is not my forte. I usually trim the flowers and stick them in a vase. 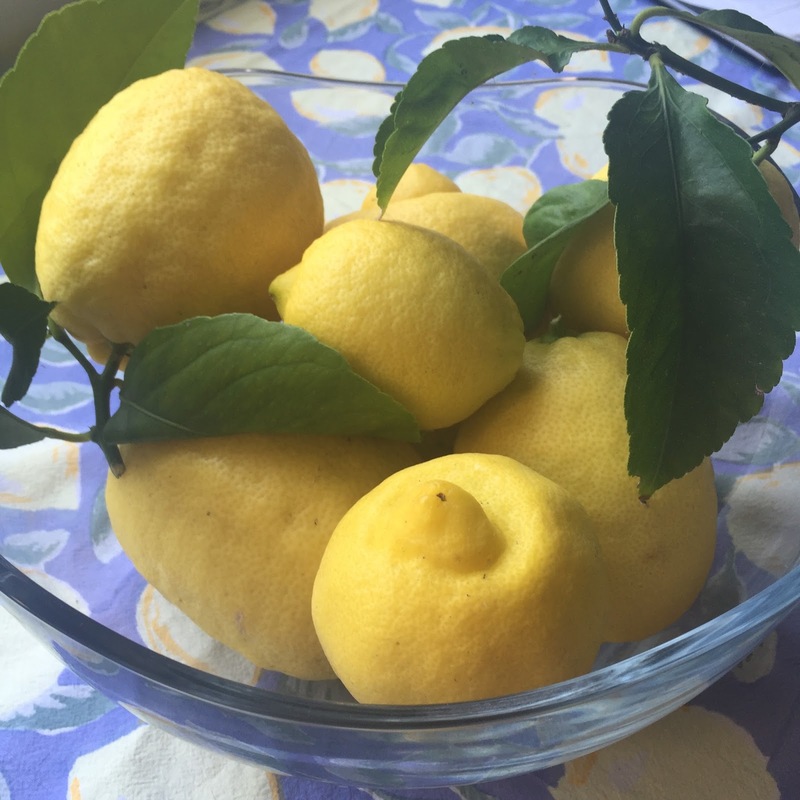 If I am feeling really creative, I still a bunch of lemons from the garden in a bowl with a few leaves attached. But with the help of The Flower Workshop by Ariella Chezar with Julie Michaels, I gave advanced flower arranging another go. I creatively applied the principles in the book and created the arrangement in the tea pot and tea cup above. 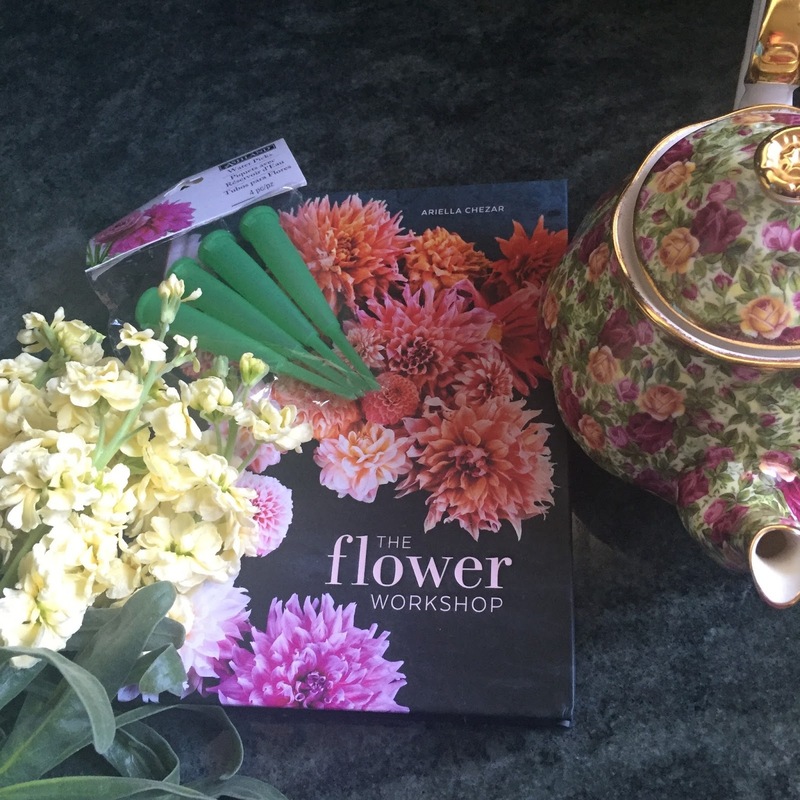 The Flower Workshop is a beautiful book filled with gorgeous photography of flowers and arrangements. Chezar provides basic and advanced advice on how to select and arrange flowers, and other types of plants, and she also tells you when specific flowers are in season. It's clear that flowers are Chezar's passion as she talks about how she has made them her life. She advocates for creative arrangement vessels and painterly flower arrangements that evoke art. Hercule Poirot would definitely approve. Here's what you'll need for the arrangement above. I used flowers (Chezar recommends shopping for flower with a bucket with water so they aren't out of water for long) , florist tubes and a tea pot. 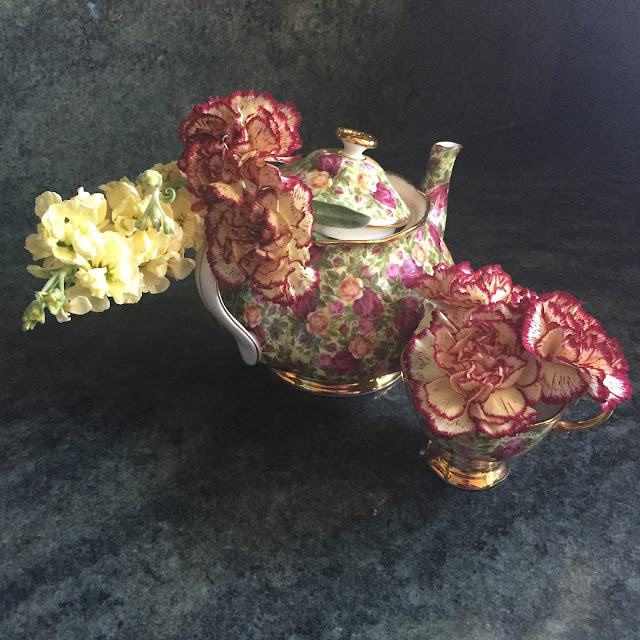 I love this tea pot and I actually use it for tea, so that's why I used the florist tubes, because no one wants tea that smells like last week's flowers. You'll also need a tea cup and a florist pin frog (see photo below). I purchased this frog at Michaels. It came in a set of two. 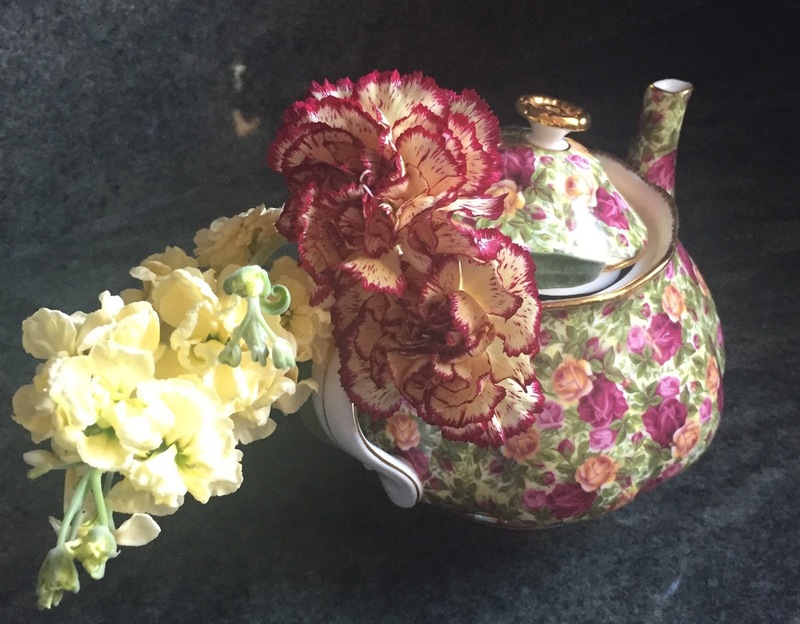 Decide which flowers you want in your tea pot. Chezar talks about the rule of three in her book, so I stuck with just three flowers per vessel. Trim the first flower to the desired size - this may take a few tries to get it right. Then open the plastic florist tubes and close them. Stick the flower in the hole in the top. Repeat three times. I used one longer flower (alas I don't know what it's called and I couldn't find it in the book, if you know please put it in the comments below) and two carnations. 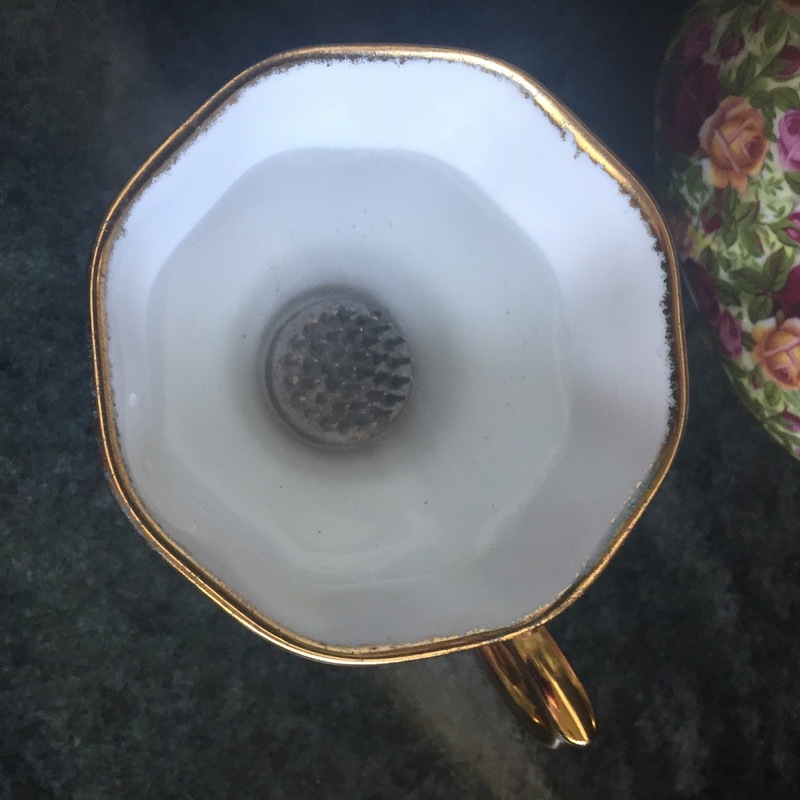 I put the tubes in the tea pot and put the lid on a little crooked. Put your frog in the tea cup and a little water. 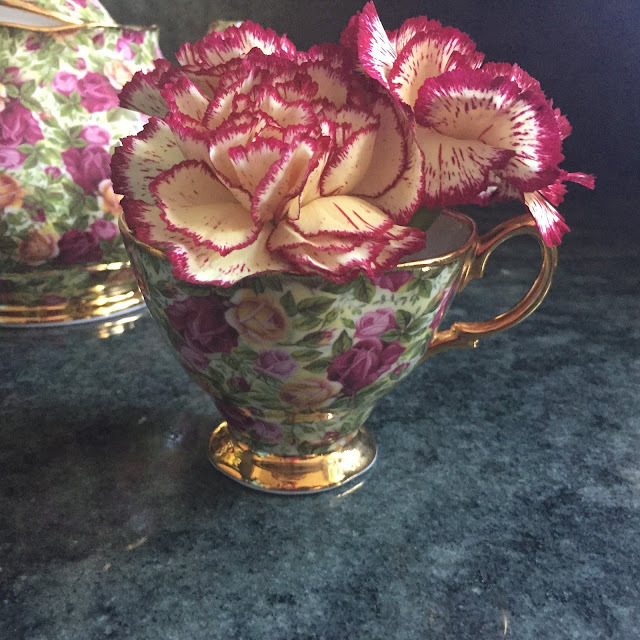 I felt OK about putting the flowers directly into the tea cup here, because tea cups are easier to clean than the inside of tea pots. Trim the flowers to the desired height and stick the stem into the pins of the frog. And you're done. For me this was a good first project. There is a lot to learn here. The Flower Workshop has more advanced flower arranging from garland made of marigolds to hand held bouquets and wreaths. Now that I have some basics down, I can't wait to try a few more types of arrangements. There is so much to learn from this book, I'm going to keep The Flower Workshop around for reference. This book was given to Mystery Playground by Blogging for Books. The review is unbiased and independent.